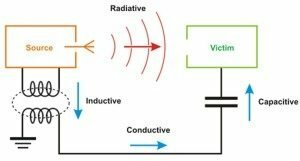 Electromagnetic interference is phenomenon of disturbance caused by interaction of undesired electromagnetic waves from neighboring devices or sometimes the system itself. In any active communication system or transmitting devices, electromagnetic interference is a significant characteristic which determines the quality of the device and system. Engineers have to take EMI into consideration during design and implementation stages of every active communication system. Performance of devices, transmission channels and equipments are subjected to the level of electromagnetic interference it produces and capacity operate in a noisy environment. Ionizing radiation is caused by interaction of an ultra high frequency waves range from ultraviolet rays to gamma rays in the electromagnetic spectrum. These waves are harmful to human body due to its characteristic to change atomic structure within the body cells. Non-ionizing radiation are caused by interaction of a signal from extra low frequency waves to visible light in the electromagnetic spectrum. This radiation cause interference with other active signals and often described as noise. Electromagnetic interference is a common phenomenon in any system which operates at radio frequency (RF) range. Due to the increasing number of transmitting devices, co-existence of efficient wireless ecosystem is significant. 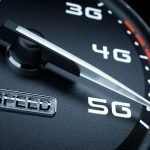 More wireless transmission techniques are emerging to support wide range of applications which all of them uses radio frequency waves for communication. There are mainly two ways in which electromagnetic interference occurred. Conducted EMI: undesired signals using a conductor medium such as a wire or transmission cable to cause interference in other system. Radiated EMI: undesired signals uses a wireless medium (like radio waves) which causes interference in other devices or system. It is necessary to strictly follow guidelines to make sure any device will not create any disturbance to other devices and intensity of the signal is safer to humans and other living organisms. Generally all electronic devices uses electrical power creates a small electromagnetic interference. In wireless transmission systems, the power of the signals received at the antenna is much lower. Lower level of EM interference is not harmful to other surrounding equipments but stronger noise could affect the quality of the signals especially devices receiving signals from transmitter far away from receiver. Malfunction of low power transmitting devices like mobile phones, household appliances like microwave oven, switch mode power supply units inside personal computers, aircrafts flying at lower altitude are some of the common sources of electromagnetic interference. Generally, performance degradation of devices and equipments are one the troubling effect of electromagnetic interference. 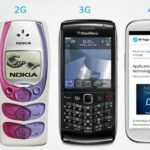 How to avoid electromagnetic interference? 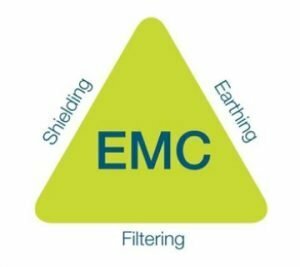 Shielding, Earthing and Filtering are known as the three principles in electromagnetic compatibility. In order fulfill the EMC standard requirement; engineers have to follow best practices during design stages, testing and product implementation. Periodic verification according to specifications may also require in some cases to make sure every components of the system works within allowed limits. Shielding: proper shielding of printed circuit boards and power modules will prevent signals radiating out and into the system. Metallic shielding is often used in complex circuit boards and amplifiers. Earthing: earthing also known as grounding is a method of adding proper signal ground connection to prevent undesired signal interference. Surge arresters and decoupling capacitors are used in high power applications. Filtering: filtering of undesired signal components are another effective method in electromagnetic compatibility. Passive and active filters are used to filter out noise components. Electromagnetic compatibility (EMC) is a standard for many countries which qualifies a product whether it meets certain requirement in the guideline. 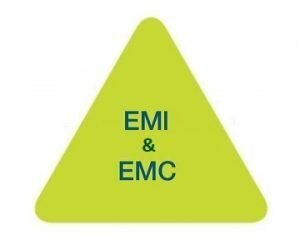 Basically EMC is a product qualifying factor which ensures a particular product doesn’t interfere with other devices via electromagnetic radiation. 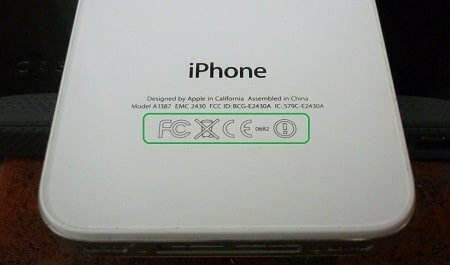 If the product emits radiation above allowed level, it will not be qualified for EMC standard. Organizations like International Committee on Radio Interference (CISPR), Federal Committee for Communication (FCC) in the United States and European Norms (EN) in European Union has strict standards for any products selling in each countries. These guidelines ensure the safety of people and restrict any violations like harmful radiation from devices. 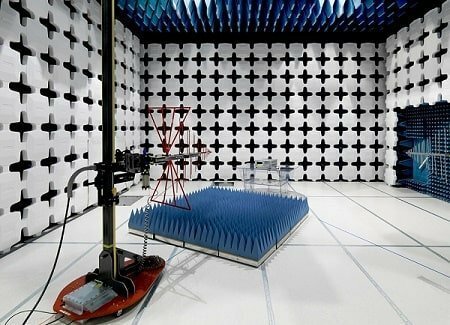 Electromagnetic compatibility is tested with highly sensitive antenna within a faraday cage known as test chamber. The device under test will be placed in a wooden table and rotated 360 degree during test. Radiated signals from the DUT will be absorbed at the antenna and radiation pattern and strength will be calculated using sophisticated equipments. Radiated emission test, conducted emission test and radiated immunity tests are conducted for determining the product qualification for electromagnetic compatibility. EMC is a compulsory standard for all electronics devices, toys, drones, automobiles, aircrafts and military equipments. Size and capacity of the test chamber is depends on the application in which the system is used.